So how is the market for sunglasses like American automakers asking for a bailout? Well, yesterday on my way out to meet some riding buddies, I stopped at a Walgreen's drug store to look for a pair of cheap sunglasses. No more than $20.00 was all I was willing to pay. I found a pair, $19.99, that look similar to the glasses I've had before, and have polarized lenses, and they fit snug. Just a few days earlier I had lost my pair of Panoptx sunglasses. I really liked the Panoptx for the styling, the polarized lenses, and the solid feel. Those cost me $150.00. I had them for about 2 years. Previous to that, I had a pair of Wiley-X glasses. That lasted me less than a year. They broke at the hinge, where the frame meets the ear piece. That was also about $150.00. And then previous to that, I had a pair of no-name brand glasses I bought at Target for $10.00. That pair also lasted me about 2 years. I ended up losing those too. So I'm thinking that sunglasses, if you wear them frequently enough, will last you about 2 years, despite how much money you paid for them. Either they break, or you lose them, or you get tired of them and want something else. The cheapo glasses I bought yesterday are not "riding glasses". They don't have the foam liner around the frames. That's ok, because on my Electra Glide Ultra Classic, the windshield and fairing does a pretty good job at keeping the wind off of my face. I only need the glasses to shade my eyes, and I like the clarity of polarized lenses. But I've also been to rallies and runs and found sunglass vendors selling riding glasses for $20.00 as well. I haven't found any kind of functional advantage of the Panoptx or Wiley-X brands, unless you need removable lenses. If you go to their websites, they'll tell you all day long why their glasses are in fact functionally better than the competition. But in reality, or at least my reality anyways, they still provide the same results as the $10.00 pairs, and last about as long. I'm wondering, are we experiencing a "sunglasses bubble", similar to the housing bubble that created the mess we're in now? How much higher will people spend on their designer sunglasses, and how much longer will it be until they realize they're not getting that much more value for their dollar? 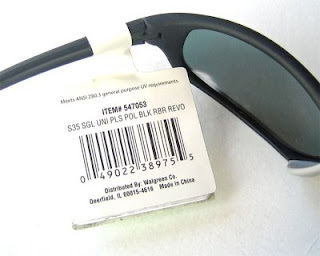 If sunglasses are supposed to shade your eyes, and reduce glare, then what is their real value? I don't think the sunglasses market will ever ruin our nation's economy, but on the other hand, we have companies like Panoptx and Wiley-X who seem to have invested themselves into America's thirst for "image is everything". Do they have a backup plan when riders shift over to the $10.00 cheapo glasses? And why can't Panoptx and Wiley-X make a pair of $10.00 cheapos? It seems like the Chinese companies have dominated the cheap sunglasses market. The US companies are stuck with the designer market. I doubt that Panoptx and Wiley-X will ever lobby Congress for a bailout should they find their market dry up into dust. If you can afford to spend $100+ on a pair, then count your blessings. I for one am questioning the value of everything I buy these days.